SeedStar™ 4HP planters are only compatible with 4600 CommandCenter displays with a version 2 (v2) processor and 4640 Universal Displays. Displays should be running Gen 4 OS software version 10.9.79-124 or newer and the most current version of Tractor Applications to be compatible with SeedStar 4HP planter applications. Additionally, dual-display mode is not available for use with SeedStar 4HP planter applications. If multiple monitors are needed, utilize a Gen 4 Extended Monitor. NOTE: Competitive equipment may be compatible with 4640 Universal Display and 4240 Universal Display. AutoTrac Universal 200, AutoTrac Universal 300, and AutoTrac Controllers are for use with the 4640 Universal Display and 4240 Universal Display. AutoTrac Implement Guidance is compatible with C850 Tow-Behind Air Carts with software update 18-2. Guidance is compatible with C850 Air Carts with software update 18-2. AutoTrac Turn Automation is available on the 4600 CommandCenter Display and is compatible with the 4640 Universal Display installed in 30 Series Tractors and newer. Additionally, AutoTrac Turn Automation is compatible with Easy Fold on SeedStar 4HP planters with 19-1 software update and mid model year 2019 planter software update. John Deere Wireless Data Transfer (WDT) helps producers save time, money, and increase productivity through telematics-enabled data transfer via JDLink™ Connect wireless telematics. Wirelessly transfer setup, prescription, and documentation files securely between office, mobile devices, and 4640/4240 Universal Display or 4600/4200 CommandCenter™ Display, eliminating the need for USB transfer. This increases producer uptime and productivity, reducing the risk of data loss, and enabling easy data sharing and more timely decision making. With WDT, producers can manually send data wirelessly to the John Deere Operations Center; data is available to review in Files and then later in Field Analyzer and the MyOperations™ mobile app. 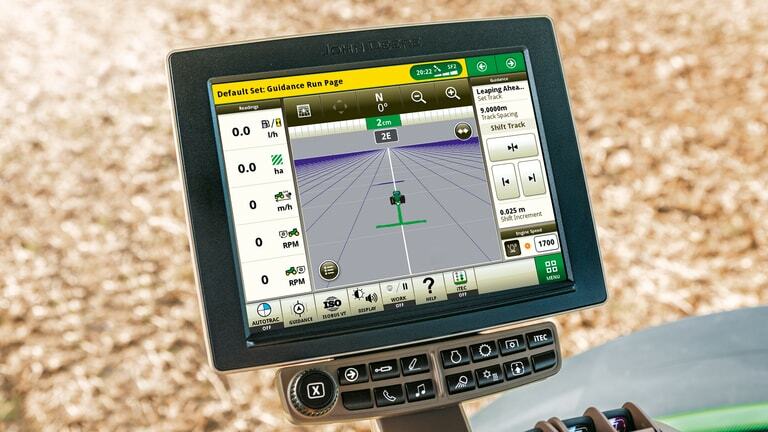 To enable WDT on a Gen 4 Display, producers must manually navigate to the Menu, System, File Manager, Export and then begin selecting the data they want to send to the John Deere Operations Center. NOTE: WDT on a Gen 4 Display does not include any auto send triggers similar to the GreenStar™ 3 2630 Display which automatically sent data after a change in client, farm or field. Set-up files and prescriptions can be transferred wirelessly from the Operations Center to the 4600/4200 CommandCenter or 4640/4240 Universal Display anytime, eliminating trips to the machines’ locations and allowing for more timely completion of field operations. Modified setup files and prescriptions will not overwrite files currently on the Gen 4 Display; only new or modified information will be imported from the setup file. Data Sync automatically sends documentation data to John Deere Operations Center every 30 seconds. Producers have the opportunity to analyze data from completed fields or view where field work is in process, making it easier for producers to make operational decisions. Data is available to analyze from any internet-connected device to make important production decisions and give operations the ability to invoice work recently completed. There are triggers that make the data available within the John Deere Operations Center including: after a field has been completed, after new work has started, or a half hour after field work has been stopped. As the Generation 4 4600 CommandCenter becomes available on more machines and more Precision Ag applications are developed, there are different CommandCenter Premium activations available depending on the machine model. Please see the following chart for machine compatibility. Functionality is dependent on machine configuration and may require additional hardware. Activation upgrade paths are available to acquire the latest technology applications. CommandCenter Premium 3.0 requires 4600 CommandCenter processor v2 hardware upgrade for model year 2014 through 2017 tractors. CommandCenter Premium 3.0 is machine specific and cannot be transferred to a different machine. CommandCenter as-applied documentation data is only compatible with the John Deere Operations Center. A USB drive with 4-GB capacity is required to transfer data to and from the Generation 4 CommandCenter display. A USB with capacity of 8 to 32 GB is recommended. Implement settings are display specific and do not transfer. CommandCenter Premium activations and upgrade activations to Premium or Automation are not available on the John Deere 4100 CommandCenter. AutoTrac RowSense and AutoTrac Vision are not compatible with the F4365 High-Capacity Nutrient Applicator.